Affärsadvokaterna are ranked in Legal 500 and Chambers. We are very proud of the assignments as well as the large number of customers and colleagues who contributed to the fantastic ranking. Read more about our ranking and customer reviews. Chambers acknowledged Mattias as a “Leading Individual” in 2019 for the seventh consecutive year. Chambers review states that Mattias Lindberg is “practical and experienced”. Clients single him out for his “accurate legal base in computerised processes and digitalisation projects.” He is also active in GDPR implementation and public procurement. Affärsadvokaterna are re-rated in the 2018 Legal 500 as “Leading Firm”. Mattias Lindberg is also awarded the “Leading Individual” award for the first time in the prestigious ranking institute. “We are very proud of our assignments as well as the large number of customers and colleagues who have contributed to this fantastic ranking! We are committed to provide legal services of the highest quality and with the greatest commitment. That Affärsadvokaterna are once again ranked in the prestigious ranking institute Legal 500 we see as a further acknowledgment that we are on the right track in our efforts. And of course we are grateful for all positive feedback from our customers, “says Mattias Lindberg, Founding Partner for Affärsadvokaterna. For the sixth consecutive year, Chambers and Partners has awarded the “Leading Individual” award to Mattias Lindberg at Affärsadvokaterna. “Our goal is always to guarantee a strong business perspective, to be solution-oriented and to provide useful recommendations to our customers. This award is a receipt that our customers really appreciate our way of working and our efforts forward. We would like to thank all our clients and partners who committed themselves to this year’s ranking and contributed with a great response to our work, which once again contributed to this prestigious award. “Says Mattias Lindberg, Founding Partner of Affärsadvokaterna. Chambers & Partners have for the fifth consecutive year placed Mattias Lindberg as a ”Leading Individual” and sources state that ”He is a very experienced lawyer with excellent legal and social skills. He is very commercial and successfully guides clients and counterparties to solutions.” Mattias Lindberg is the founding partner of Affärsadvokaterna and he has “considerable experience in TMT matters, including outsourcing, IT and privacy law”. “Thank you all for the tremendous feedback”, says Mattias Lindberg, Founding Partner at Affärsadvokaterna. Affärsadvokaterna has been ranked as a “Leading Firm” within its field in the 2017 edition of Legal 500. In addition, Mattias Lindberg has been ranked as a ”Recommended Lawyer”. We are very proud of both the mandates and the large number of clients and colleagues who have contributed to the fantastic rankings! “We have been striving to offer legal services of the highest quality and with the greatest commitment. We take the ranking as a “Leading Firm” by Legal 500 as we are on the right track in our drive. We are very proud of both the mandates and the large number of clients and colleagues who have contributed to the fantastic ranking! And we are also grateful of course for all the positive feedback from our clients”, says Mattias Lindberg, Founding Partner at Affärsadvokaterna. “I value greatly all the positive words from both counterparties and clients”, says Mattias Lindberg, Founding Partner at Affärsadvokaterna. Affärsadvokaterna has been ranked as a “Leading Firm” within its field in the 2016 edition of Legal 500. In addition, Mattias Lindberg has been ranked as a ”Recommended Lawyer”. In its decision Legal 500 states that ”At Affärsadvokaterna i Sverige AB, clients consider practice head Mattias Lindberg’s knowledge of data protection laws and EU directives to be ‘outstanding’”. 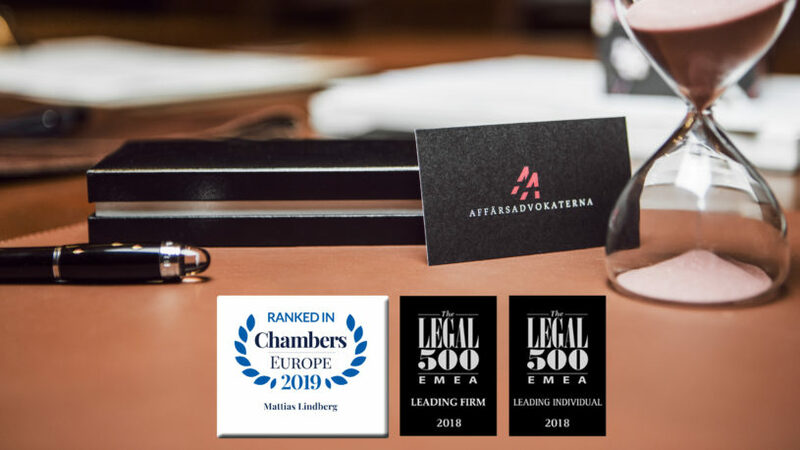 “Since Legal 500s ranking is based upon in-depth research including interviews with clients as well as lawyers, we are very honoured to receive such a recognition”, says Mattias Lindberg, Founding Partner at Affärsadvokaterna. Chambers & Partners have for the third consecutive year placed Mattias Lindberg as a ”Leading Individual” and sources state that ”As a client you feel very well represented and confident in negotiating situations when accompanied by Lindberg. He has always provided excellent service.” His recent work has involved outsourcing, personal data policies and dispute resolution”. Affärsadvokaterna has been ranked as a Leading Firm within its field in the 2015 edition of Legal 500. We are very proud of both the mandates and the large number of clients and colleagues who have contributed to the fantastic ranking! Mattias Lindberg is recommended in the 2015 edition of Legal 500 as a “great negotiator and tactician”. Mattias Lindberg is recommended in the 2014 edition of Legal 500 as a “skillful negotiator and tactician”.